As I’m still getting over a rather nasty cold, I’ve spent more time than usual poking aimlessly around the internet. One of the things I do on vacation or while sick is try and catch up on the various webcomics I like. Here are a few of my favorites that relate to science and/or engineering. Angela Melick is a Canadian sustainability engineer, and responsible for the beautiful and funny comic Wasted Talent. She covers many aspects of life as an engineering student/early career engineer with great humor, from getting your P.Eng certification to the personalities of engineers to excessive acronym usage. Being Canadian, there are also hockey jokes. Randall Munroe’s incredibly popular xkcd covers physics and computer science with occasional engineering references (just one more…). While he’s now a professional webcomic artist, he used to work for NASA as a roboticist. The art is minimalist, instead relying on wit and humor. Be sure to read the alt text. Abtruse Goose is another favorite, though it’s also more physics/math oriented. The real world after school (shown above) is posted on my desk. New to me, Return to Zero is a comic for the sparkies, featuring comics about analog gurus and engineering notebooks. So if you have nothing to do for awhile (or are actively avoiding doing something), spend while going through the archives. And of course, please share your favorite comics in the comments. Saturday Morning Breakfast Cereal (http://www.smbc-comics.com/) by Zach Weinersmith is another great comic. It doesn’t always cover engineering but I’m still left in stitches just about every time it’s updated. 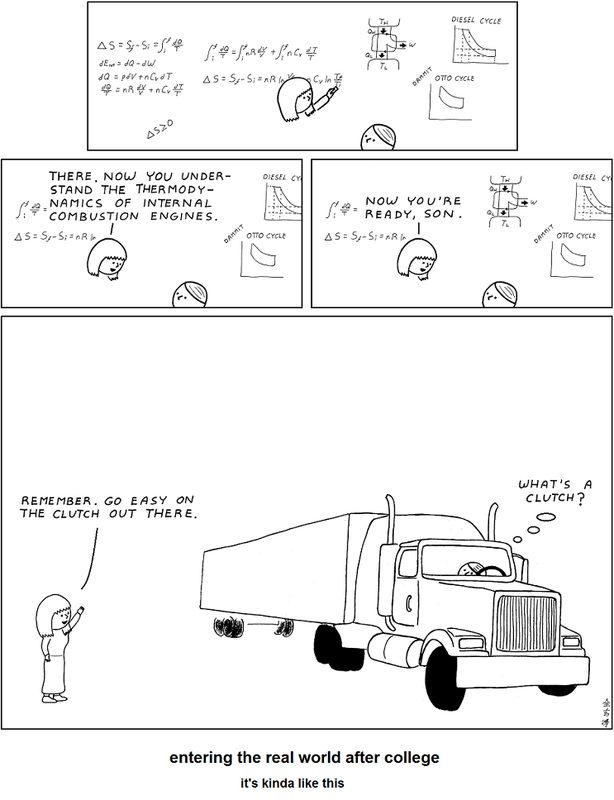 Should also mention I love Abstruse Goose as well. xkcd.com is probably the best all round technical comic. Some of the data analyzed and presented (backed up with references) is phenomenal.